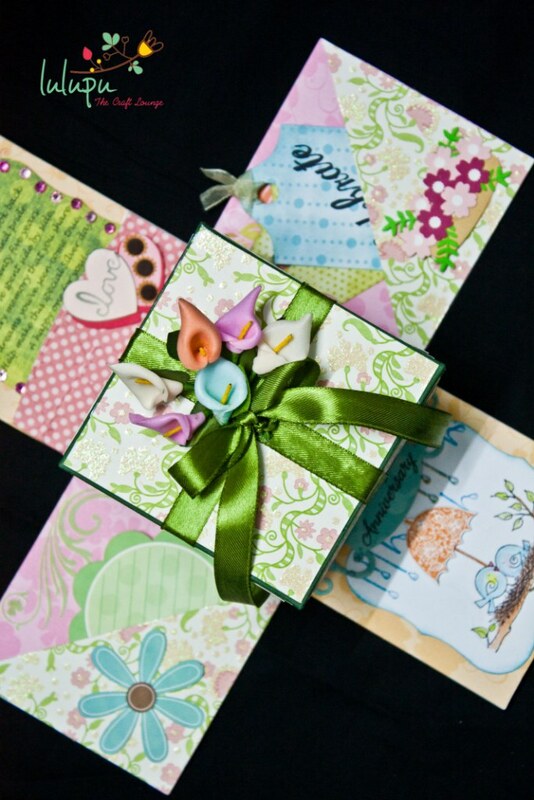 It's almost June and all through May, we've all had fun learning and sharing cards with special folds. 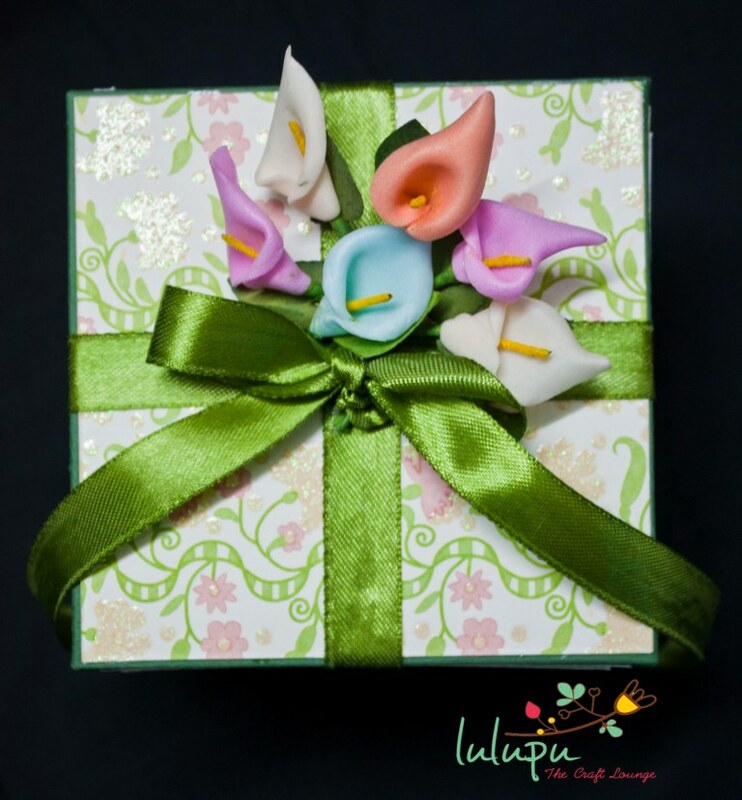 We also welcomed Juhi Khanna - a very talented crafter, as a part of our Design Team, so it's all been busy busy. But May is not over yet and we still have something for you - something that is jaw-dropping; well, almost. Being a part of the Design Team must have some privileges, right? 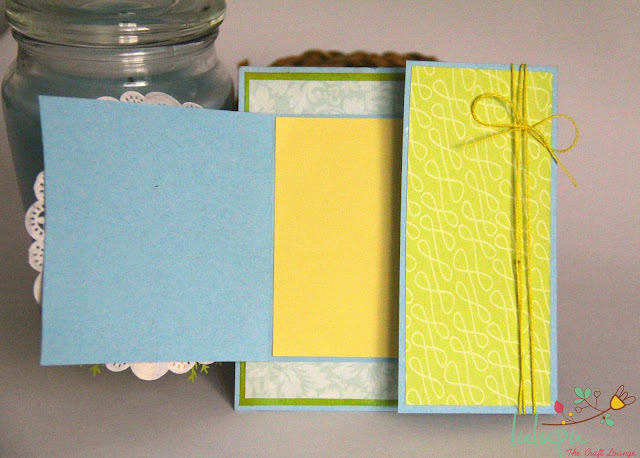 We all got to pick and order for our favourite designs while they were being ordered for the store and as a result, I have mine with me already and I am ready to share some great quick cards with you that you can easily make with Washi Tapes. Here's Part 1 of the video..
How have you been? I am guessing pretty good with all the amazing work you guys share! I am here to announce our Design Team Call Winner! Yep we found our Lulu Pooh! 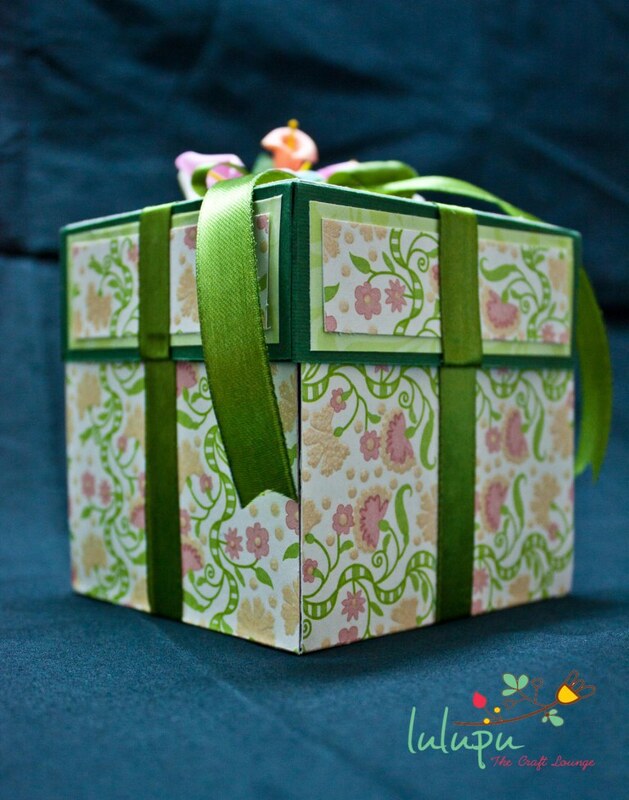 Here's a warm welcome to Juhi Khanna who is one of the most seasoned and creative crafters around India! Please read on more about our lovely new member! "Juhi is an electronics engineer and mum to a 5.5 month old by day and a paper crafter by night. 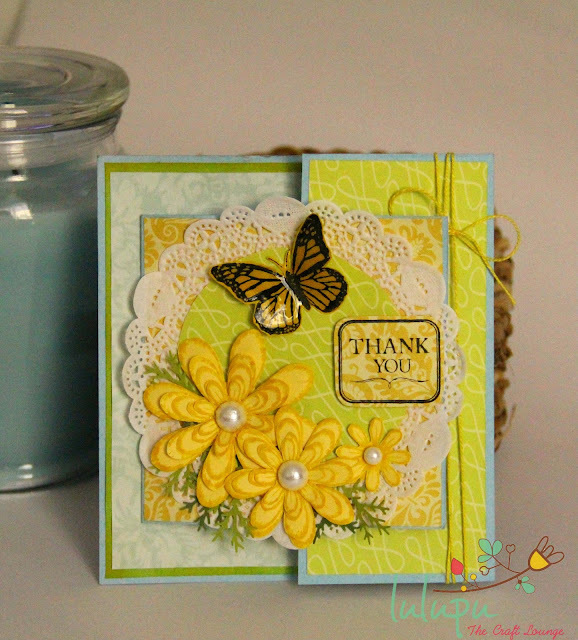 She loves to create bright and happy cards and most of her cards almost always have flowers on them! She loves to make her own flower embellishments. 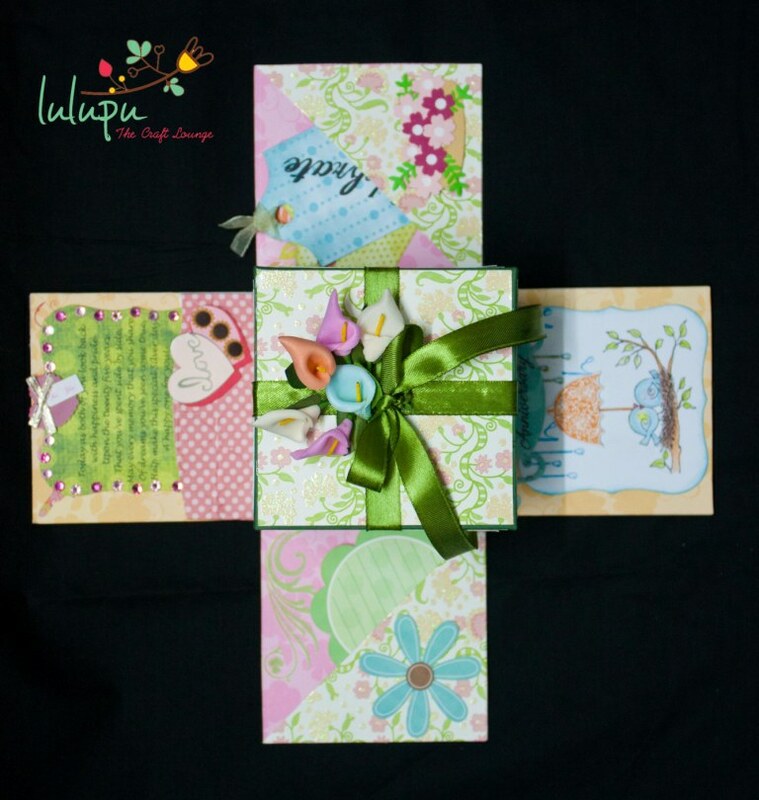 Juhi is a fabulous scrapper and had many pretty mini albums to her credit. She feels that they are so quick and easy to make and look super cute. 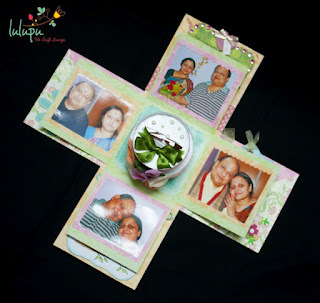 An inspiration to many, Juhi has been one of the oldest crafter and blogger in India and beautifully polished in her work. Her favorite tool is her die-cutting machine. 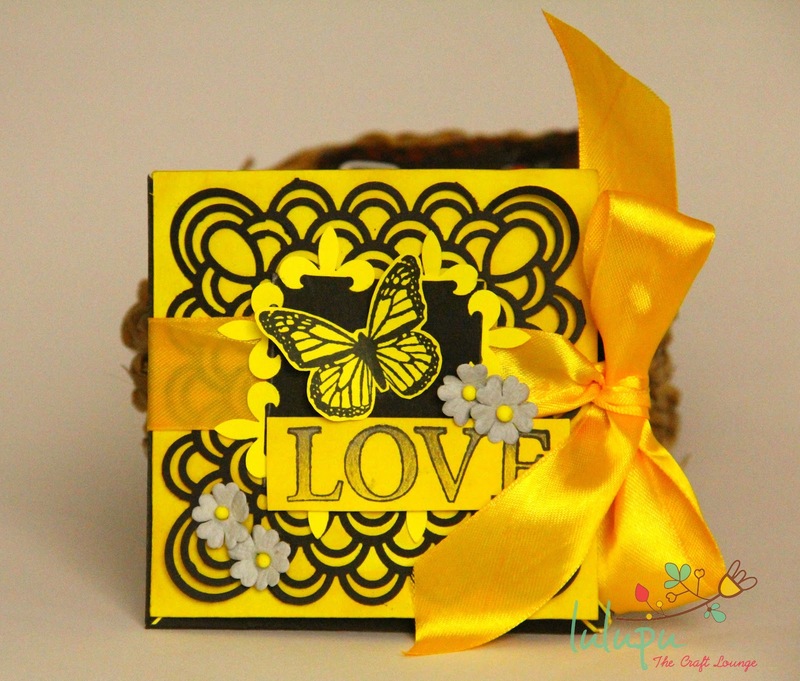 She loved her dies to bits as they help her with endless creative possibilities! 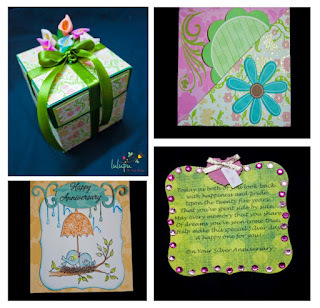 She has a thing for stamping and coloring images with markers and loves to use all kinds of ribbons and laces, off the shelf die-cuts and stickers on her projects." Am sure many of you already would have seen her gorgeous and inspiring work at her Blog - http://www.juhishandmadecards.com/. If not then you must must visit it! Do stay tuned to watch some amazing inspiration coming your way in June! What do we have in store for you for the month of June? Any guess? But before that we are gonna end May with a Big Bang!! Shhhhh...... check back our post tomo! You are gonna love it! I am at Pune holidaying and that's why no time for blogging and crafting...Thank God I had the foresight to make this one in Udhampur itself. 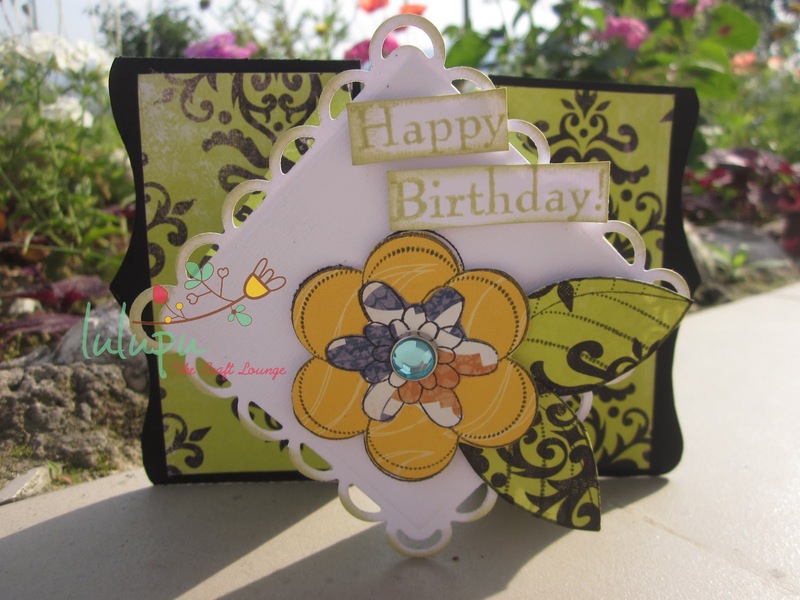 Well the surprise in this post is not only the fold card I attempted and successfully made but also the video I made. Please be gentle people and let me know what you think of it. Journal Cards - Life Is Good Double-Sided Cardstock 12"X12"
Shruti here and am back on Lulupu to share with you guys a pretty little folded card I learnt the other day. It is probably the easiest card making tutorial ever! You can even get your kids to make this.. trust me, they’ll have fun making it! Now.. I don’t know what they call this fold.. Maybe Khush can help me out here. Meanwhile, I am gonna call it the One Minute Fold Card.. Here is how it looks..
Take any square sized paper. 6x6 or 8x8 works best! What I have here is a 6x6 pattern paper. Now fold the paper like I have in the picture below. Prepare a little pocket for your card. I decided to go for a triangular pocket. Gather embellishments of your choice to deck up the pocket. 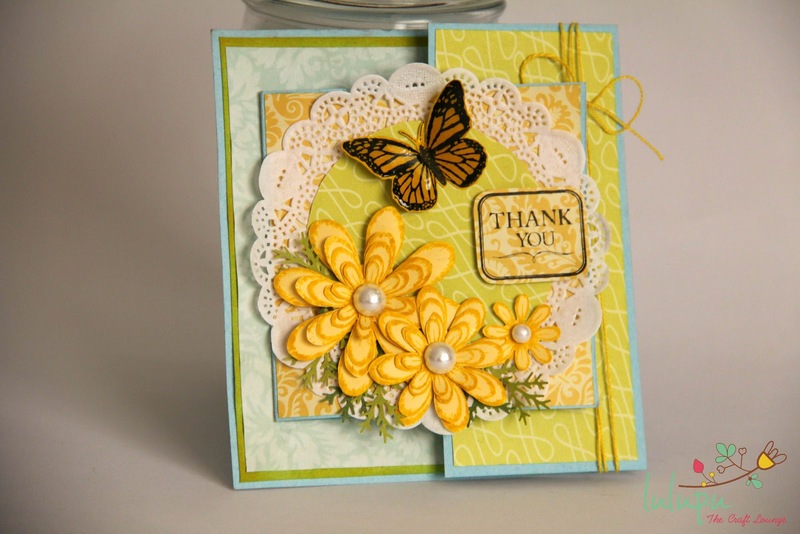 I have some flowers, a butterfly stamped and cut and a sentiment here. I have also tied a yellow and a black ribbon on the pocket. 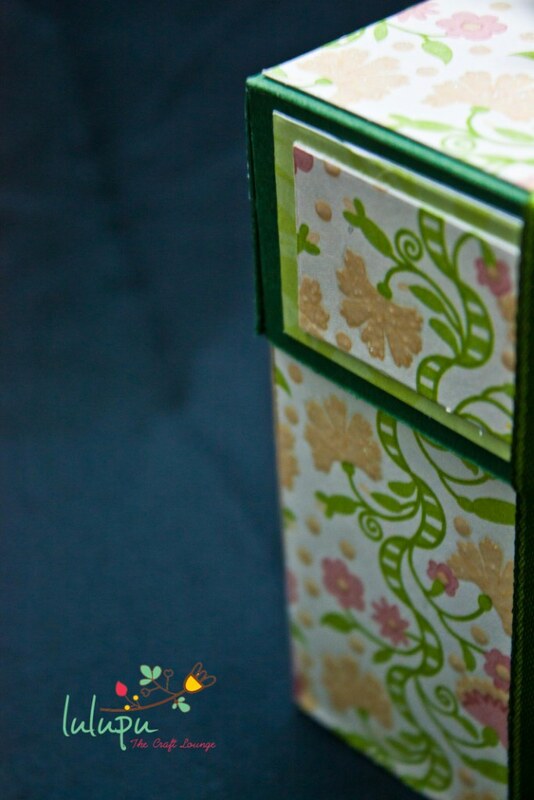 Once you’ve embellished it, apply glue only on to the edges of the pocket and stick it on to the pattern paper. 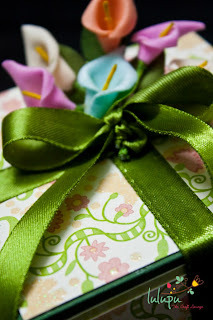 Now, let us make a top cover for the card. Since I used an 6x6 pattern paper, I cut out a 4.3x4.3 inches and stuck a MS punched paper on top of it.. You may embellish it however you like. This is how the card should look like once you're done attaching the ribbon. This is my favorite step! 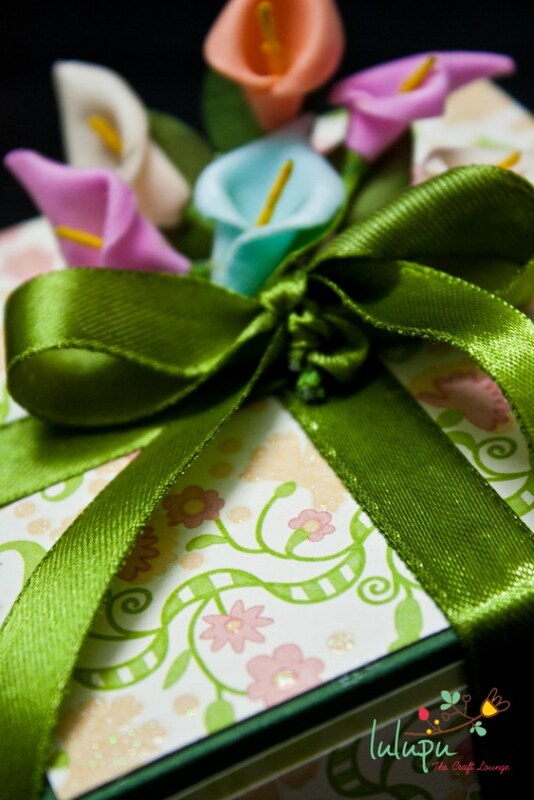 Now is the time to decorate the card and tie the ribbon into a pretty bow. I decided to keep it simple. 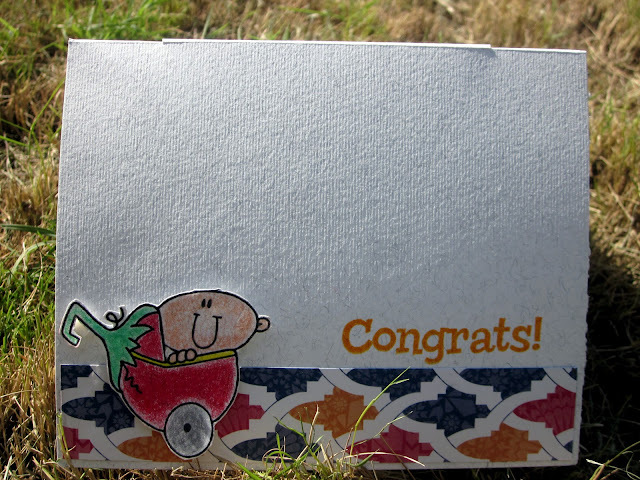 So here is how I finished my card!! Simple and easy to make, isn't it? Do try it out and click a picture or two and share it with us! The flowers, ribbons and pearls are from my stash. 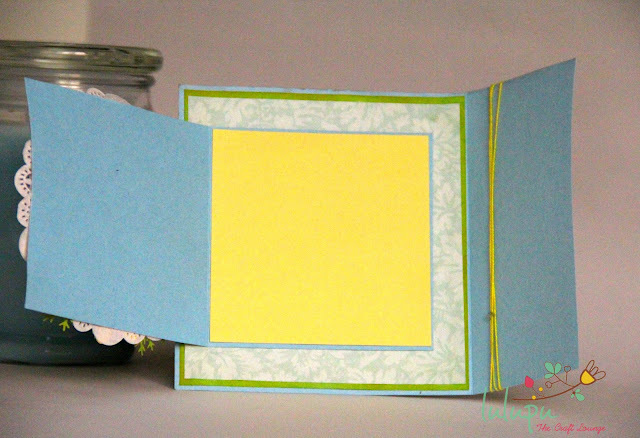 This time I made another flappy card which seems to be the trend around here in Lulupu... I won't say much.. Just go on to show you guys the pics of it..!! yes it is a PINK card AGAIN... I seem to be fascinated by the color, I have absolutely no clue why though! 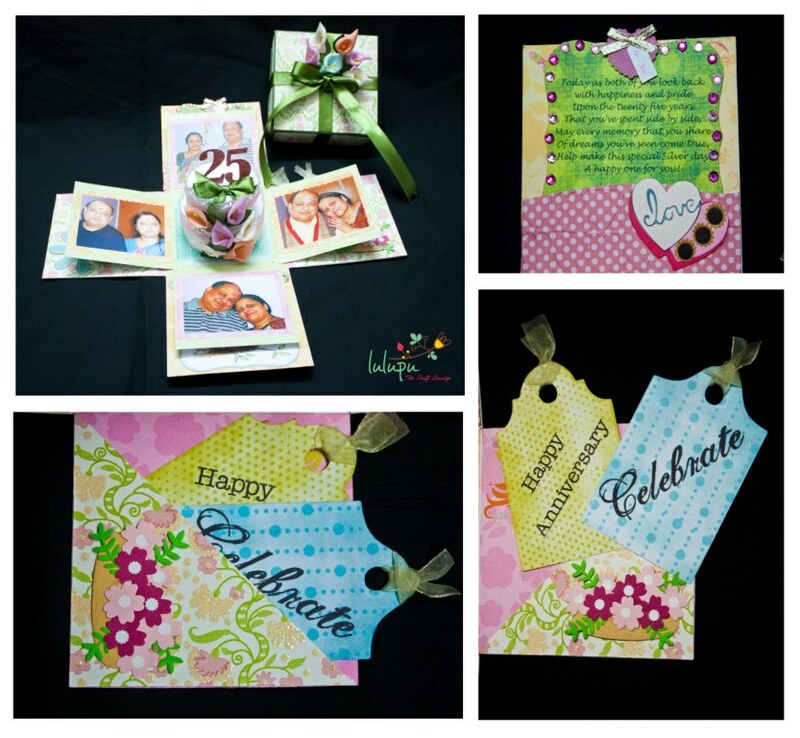 The central focal image is from a PP which I have fussy cut..
Khushboo's Six fold card was something I had seen before. 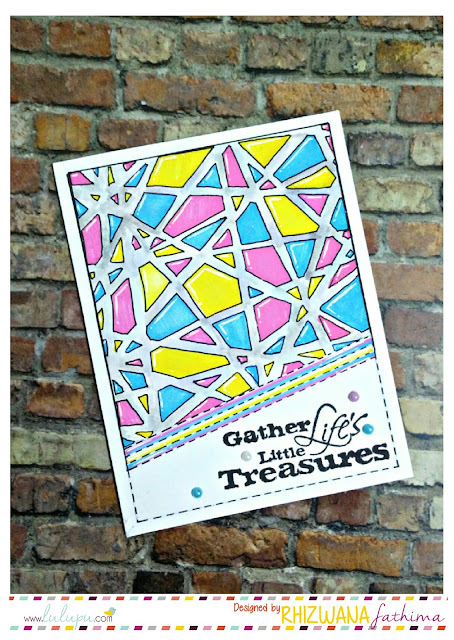 But even so, it was so colourful that I decided to make today's card in a similar manner - with lots of patterned papers!!! And I borrowed another idea from her card; I made something similar to what she did to hold my card in place. 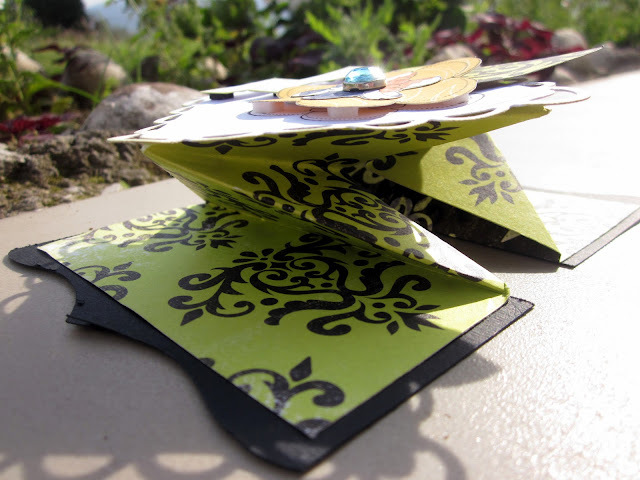 It's a very simple fold and I am not sure what it is called so I'm calling it a Double fold card, simply because it has two flaps overlapping one another. It's a get well soon, kind of card and I decided to make that because I haven't been keeping well the past two days.. So there was the inspiration. The final card measures 4"x4" and I've used some amazing PPs from the Lulupu store (full supply list at the end of the post!) Here's the card! Hope you guys liked the card and enjoyed the video(s)!! See you all next time! Honestly I was in jitters...to try the folds but SCOR PAL really makes your life easy. I had a ball making this.And If a person like me can try and successfully make a fold card I think You should definitely give it a try. I do not have a stand and though I gave my husband enough notice to get me one.....He didn't and that 's why I am really sorry that despite all my noble intentions I cannot show you a tutorial.But as soon as he gets the stand...I will upload a tutorial. Keep coming back for more inspiration. 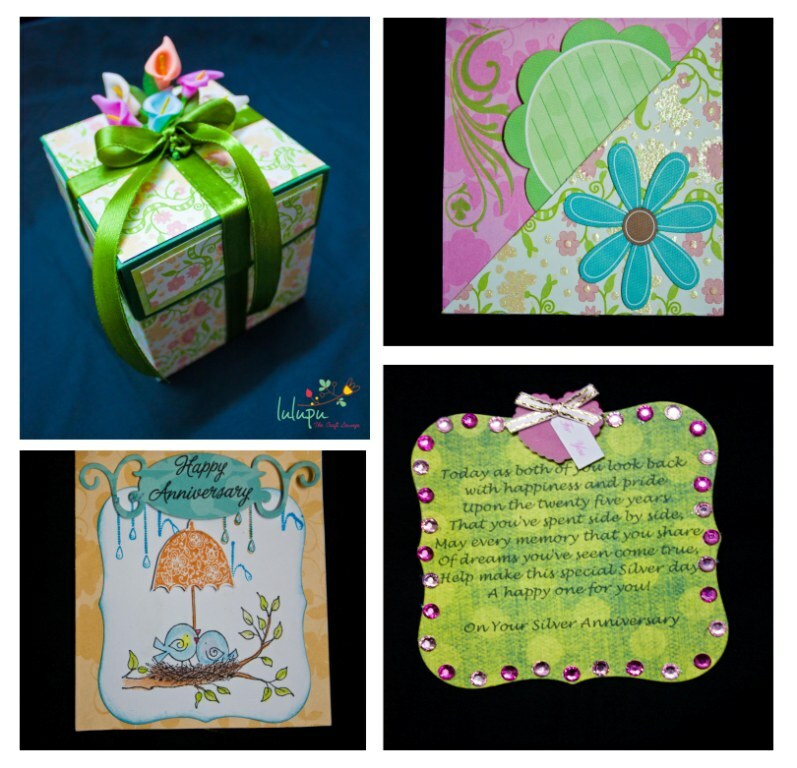 Are you having a crafty time? Well we had a fab April with you all, thank you for all your love and support! It's May and we, the Lulu Poohs would be sharing a whole new variety of Different card fold techniques for you to try this month! Did you checkout Khushboo's fab Six Fold Card Tutorial? It totally rocks and a must try! Super easy and fun! 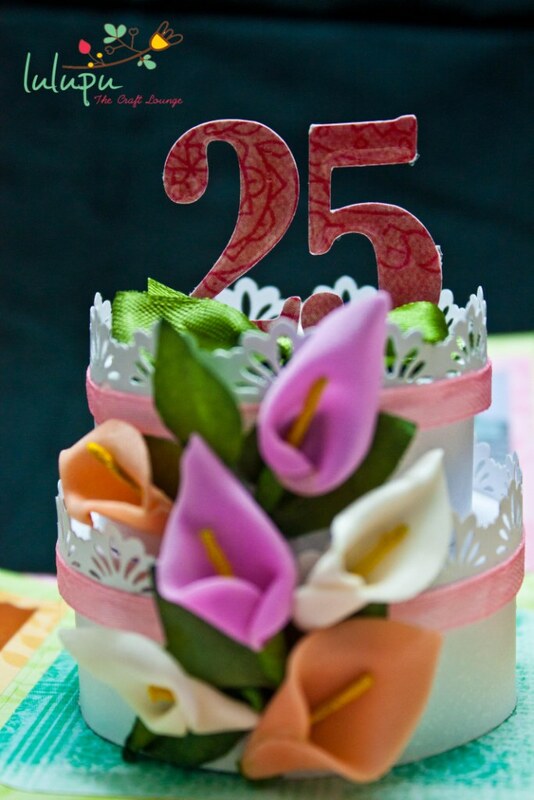 So it was a 25th Anniversary and it would usually be gliterati ? Right? Hmmm, well I went on softer tones of green, pink and orange with a dash of blue. And I feel its one of my best explosion cards and it was pretty hard parting with it. (am sure you know this feeling, wink) I knew i had to use these gorgeous lilies so i changed my usual paper cake to a 2 tier lacy cake with frosty sparkles. So behold, its a picture heavy post! Hope you enjoy it. Fashion District - Custom Value Pack Paper Pad 12"X12"
Scor-Pal Measuring & Scoring Board 12"X12"
Happy Tuesday.. What's been cooking.. A brand new month has started to bring out all the new creative juices from all the talented crafters all around.. Just a note to bring to attention before I move onto my card.. We have a DT call going on at Lulupu from the 1st of May to the 15th.. Please check the blog here for details.. Score it at 4" and 8" on the 12" side. Turn your card stock 90 degrees and score at 2" and 6'. Now your CS would look the picture below. Can you see the score lines clearly in the picture?? eww I seemed to have missed a step while clicking the pics... Damn.. Anyhow let me explain it through the pic only...If you look at the pic.. On the top right hand side, the part has been removed completely, from the edge to where the score lines meet.. You have to do the same thing for the extreme left panel too so that just the center panel remains. Now when you look at the center of the Card stock, you would see three equal 4' squares.. The left square cut diagonally as shown in the picture above. You have the do the same thing on the extreme right hand square keeping in mind that the direction of your diagonal should be the same as the one in the left. It would ultimately end up looking like the pic below. Now you can see the three panels on the bottom side of your scored card stock.. You have to make horizontal cuts from the left to the right till the score line. DO not cut off the entire panel.. Just a slit...These horizontal slits would give you folding flaps while removing a triangle on the right side square. your card stock should look like the pic below once you have made the horizontal slits.. 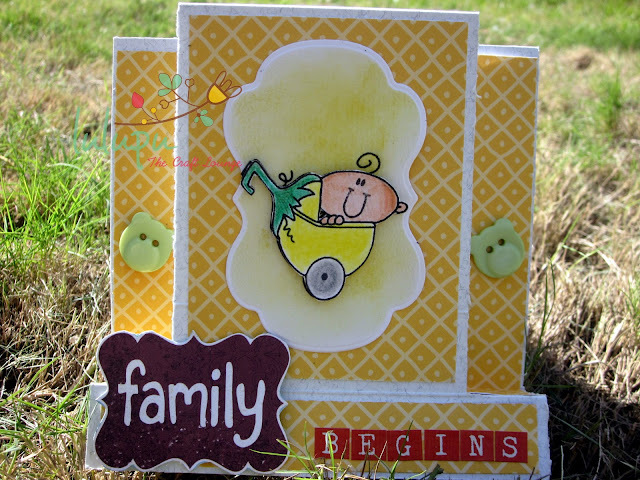 This is my finished card.. The PPs look gorgeous against black.. Thanks for dropping by.. For nay questions please feel free to drop in a comment and I will get back to you ASAP.